Who would have thought plants could solve crime? Check out this DVD and learn how! In a world of criminal forensics, every little thing can spell the difference between catching a criminal or that criminal slipping away. To the amazement of some of the strongest fields of criminal forensics is that of botany. Plants are everywhere in our world and in some cases are as unique as our own fingerprints. Come join narrator Dr. Jennifer Gardy, British Columbia's leading molecular epidemiologist for the Center for Disease Control through the science of evidence and the strange events one can encounter in the field. Any fan of mysteries and criminal science or a student of criminology can find enjoyment and knowledge with this amazing enhanced DVD. The unique and mysterious world of plant-based criminology is only a few short clicks away! The Science of Crime: Introduction � The viewers are introduced to the upcoming video about how nature is used for crime solving. Forensic Science � Dr. Jennifer Gardy is a disease detective. In this segment she describes her job. 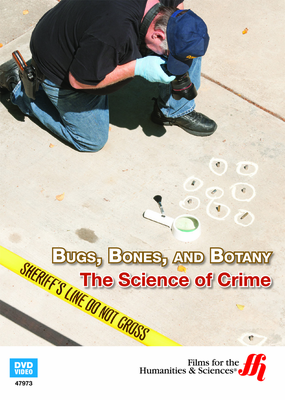 Professor Gail Anderson is an entomologist who explains how bugs are studied in a crime scene. An Odd Clock � The first insects that can be identified on a pig carcass are maggots. Professor Anderson collects them for additional studies. The development of maggots can be used to estimate how long a corpse has been decomposing. VENUS Laboratory � A unique underwater study begins at the Victoria Experimental Network. Experts can watch the decomposition of a carcass in real time using a remote camera. Forensic Botany � Gerard Courtin discusses how vegetation can reveal the length of time that a skull has been in one area. Realistic Simulations � Gerard Courtin gives an overview of what he looks for when investigating a crime scene. Forensic botanists can determine the location of a murder in multiple ways.